It seems like everyone these days is talking about reading aloud. There is so much advice and information out there about it that it can easily start to seem like reading aloud is a complicated activity that requires a lot of specialized knowledge and diligent practice to be done correctly. 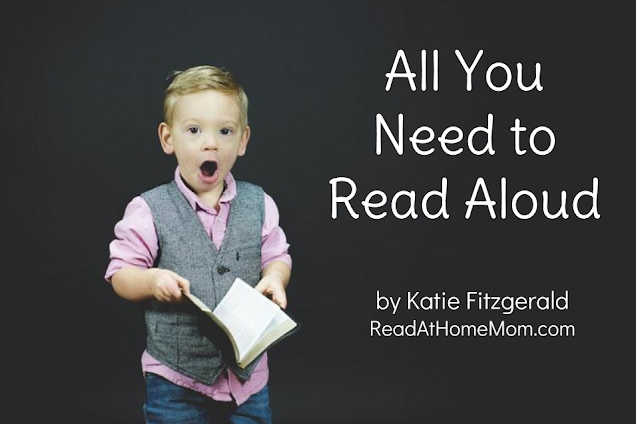 But really, when it comes down to it, successful read-alouds only require three things: a good book, an engaged adult, and a receptive child. upholds (or at least does not undermine) your family's values. appeals to the adult reader. appeals to the child listener. gives read-aloud time her undivided attention. pushes through feelings of awkwardness about reading aloud for the sake of the child's experience. models a positive attitude regarding books and reading. selects books not at random, but with intention. is calm and not in the midst of a meltdown. is not already deeply engaged in another activity. may already be looking at books or asking you to read aloud. does not turn down your invitation to hear a story. Good books are steadfast and reliable; the moods of human beings (especially young ones!) are much less so. Though some experts suggest that you must read aloud for a certain number of minutes every day lest your child not get into a good college (!!! ), it is much better to prioritize quality over quantity. Suggesting a read-aloud when your child is in a particularly ornery mood or tearing him away from his cool LEGO creation to read when he'd rather not just causes him to develop negative associations with reading aloud that can easily be avoided if you just wait for windows of time during which he is clearly receptive to hearing stories. Watching for those opportunities is a much better way to spend your energy than trying to force a regular reading schedule. Want to see how reading aloud looks in my family? Check out the Read-at-Home Kids Report, my monthly-ish feature where I share the books my three girls are enjoying.